Shortly after Mountain Lion was released I did a clean installation onto my HP 4530S and have been very happy with the result, but I am also a huge Ubutu fan and I’ve been dual booting Ubuntu 12.04 LTS through a SD card on the same machine. All was working fine except I don’t like the Ubuntu booting speed (it’s one of those 95MB/s 16GB Sandisk SD cards, fast on the paper but it takes over 30-second to boot into Ubuntu) so I decided to dual boot ML and Ubuntu from the same hard drive (Agility 3 SATAIII 120GB, http://www.ocztechnology.com/ocz-agility-3-sata-iii-2-5-ssd.html) and it turned out to be not very difficult. 1) Re-partition hard drive ML installation, when I did the ML installation, I started with 1-partition scheme as I was not planning for dual-booting. To re-size the ML partition is a piece of cake (I was amazed how Mac OS X can handle this so well, online resize the OS drive, looking at you Window$), just launch disk utility -> click on the hard drive, click the + sign, adjust the divider, click on the new partition and adjust the size through its size from the text field if needed. The new partition will be created as free space and no other changes are required. Hit Apply. 2) Reboot with Ubuntu installation disk, choose “Something else” when asked how to install, create a ext4 / partition and a 2GB swap partition (adjust the sizes if you want, I have 8GB of RAM so I am not worried about swap that much). My root partition is created as /dev/sdb3, when it comes to boot loader installation, make sure you choose this as where GRUB would be installed, if you choose the wrong partition, first partition, for example, you will need to do some extra work to fix it. 3) Once Ubuntu is installed, reboot with Unibeast, make sure to choose the hard drive ML installation when Chimera menu comes up. Log in to ML and install Chimera again from HP installer (or Multibeast). 4) Shutdown, remove Unibeast installation disk, power up, when Chimera boot logo appears, hit any key you will see the Ubuntu partition along with the original ML partition. 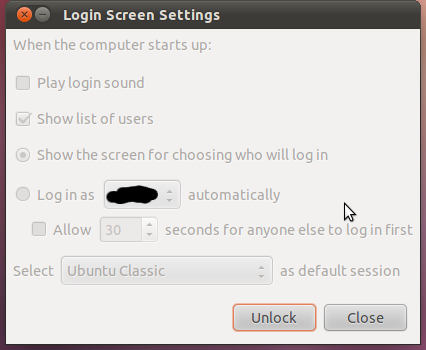 Note: This post is created after I successfully dual boot into the newly installed Ubuntu 12.04 LTS. Cheers. 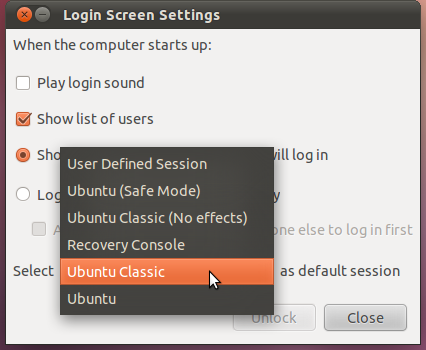 3) Reboot, click the setting icon on the login screen to make sure GNOME Classic is selected. This needs to be done only once. /dev/sda5 is the root partition. NOTE: all the above changes require root privileges. The difference? It now takes about 3-4 seconds to launch Google Chrome from cold start. Regardless which method is chosen in step 4, it’s usually safer to change the network setting through a local console instead of a remote ssh session.